Description: Train 7 enters the Division St. trackage. Description: Train 7 rolls along Division St. trackage. Description: Train 7 heads off the Division St. trackage. Description: Train 7 rolls past the yard. 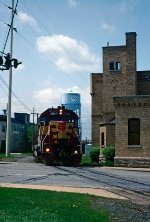 Description: Train 7 rolls past the former Pabst Brewing warehouse. Description: Train 218 is leaving WC's Oakland St. Yard about to head onto the GBW trackage and head to Black Creek to head to Chicago on home rails. Description: Train #20 returns from Green Bay passing behind the downtown area. Description: Train #20 returns from Green Bay passing by the yard next to Whitman Field. Description: Train #20 returns from Green Bay approaching East Oshkosh. Description: Train 45 enters Shops Yard. Description: A light #20 returns to the home terminal of Shops Yard. Description: Two light GP40's race back to Shops Yard with train #20. 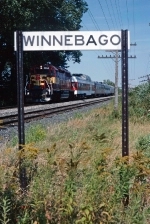 Description: Train 218 approaches the west switch at Winnebago. Description: Train 218 pulls into the siding at Winnebago West to meet #7. Description: Train 218 pulls down the siding at Winnebago to meet #7. Description: After meeting the passenger extra at Burlington train 41 continues west to Shops Yard. Description: Train 218 rolls down the main behind for GP40's while #7 ambles up the siding with CSXT power. Description: A westbound freight rolls through the sags east of Blenker. 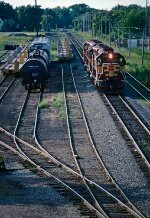 Description: An eastbound empty coal train from the WPS Pulliam Power Plant in Green Bay heads down the main. Description: An eastbound empty coal train from the WPS Pulliam Power Plant in Green Bay rolls over the Fox River bridge. 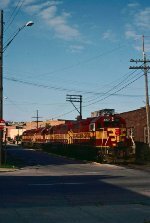 Description: An eastbound EAB inspection train rolls down the main. 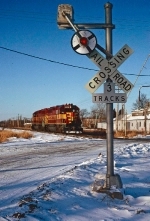 Description: An eastbound EAB inspection train crosses over from the Neenah Sub. to the Black Wolf Sub. at Tower CF. 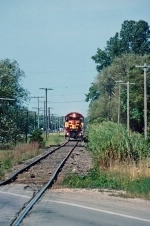 Description: An eastbound EAB inspection train rolls down the Black Wolf Sub. 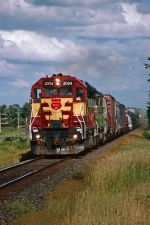 Description: An eastbound EAB inspection train rolls down the Black Wolf Sub. along Broad St. 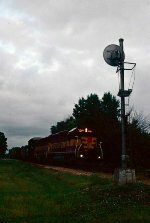 Description: An eastbound EAB inspection train rolls down the Black Wolf Sub. nearing the US 45 crossing. 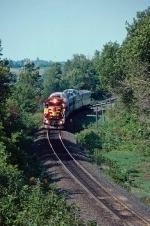 Description: An eastbound EAB inspection train rolls down the Black Wolf Sub. crossing US 45 and passing the wig-wags. 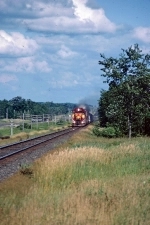 Description: An eastbound EAB inspection train rolls down the Black Wolf Sub. 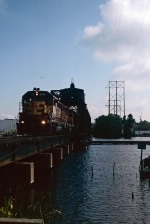 as a westbound freight hustles up the Neenah Sub. 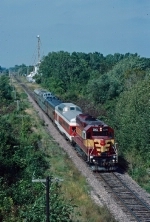 Description: An eastbound EAB inspection train rolls down the Black Wolf Sub. at Subway Rd. 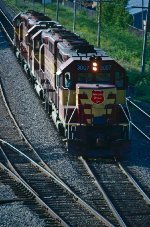 Description: The eastbound EAB inspection train heads up Byron Hill. 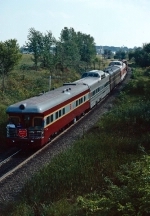 Description: An eastbound EAB inspection train backs from the Black Wolf Sub. to the Neenah Sub. at Subway Rd. Description: The National Railroad Museum excursion to Kewaunee with Great Lakes Western Equipment loads at the ex-CNW depot.